How Much of an Advantage Does a Bodybuilder Martial Artist Have Over Someone without Big Muscles? Would you believe me, if I told you that overall, in high-level martial arts, a musclebound practitioner is actually at a disadvantage in a fight? Now, don’t get me wrong; muscle tone “is” important, but having huge muscles popping out all over your body is not. If you’re in a style that pits strength against strength, then I suppose that bulging biceps and triceps would help you out, but I think most of us would agree that martial arts isn’t about muscling your way to victory or safety. Yes, you need enough strength to be able to effect a wrist lock, but if you have to completely “muscle” your way into the lock, then 95% of the time, you should have already changed and softened them up with a strike of some type. In Kung Fu (Gung Fu) styles that rely on sensitivity, being too muscle bound in the arms can really hinder your ability to defend yourself (or others). 1. If you can’t touch elbow to elbow, in front of your body, then you are leaving a big opening up the center. And your enemy doesn’t have to attack to the inside of your arms, either. If you don’t guard your inside line, then he or she “can” punch through that opening, but if you think you’ll simply close that opening in your guard, fine … you have just been faked. By closing that line, you open up a different line. And your opponent gets you … easy peasy. 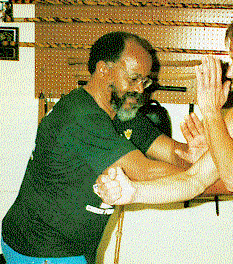 Note: Jesse Glover, Bruce Lee’s first student, was bulky up top, yet he was dynamite at sticky hands (Chi Sao). He could guard that line, even though he couldn’t touch elbows in front of his body. He had a way of getting opponents to “overcommit” on a different line, thinking they had a new opening. 2. If you have a lot of muscles in your arms … big, nice, hard, muscles … they act like marble columns. And it’s this sturdiness that makes them slow moving. I learned years ago, that a solid block by my opponent was a blessing. When you walk into a building with solid columns, do you continue walking right into the stone obstruction? “already” be moving around it onto a new line. So, am I recommending no weight training whatsoever? Do you remember The Return of The Dragon? 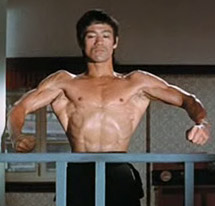 Do you recall the Bruce Lee upper body flex, when all those muscles rippled out, making him look like a cobra? Well, those were “supple”muscles. He still had the flexibility of a thin person’s body. His body building did NOT hinder the movement in his arms. Finally, think of some of our lifelong martial artists. Some of them, in their 70s, still make martial arts work effectively… even against younger fighters with oodles of muscles. In our old age, we lose muscle. It’s inevitable. the younger, heavy lifters, might just be giving older martial artists a big advantage.